To create a vitalized company and achieve its goals of the "integration of telecommunications and life design" and the "ambitious development of global business." 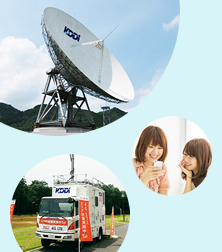 KDDI is promoting the integration of telecommunications and life design, building concentric rings of life design services, such as commerce, finance, energy, entertainment, and education, around a core of the domestic telecommunications business and customer base it has built to date. 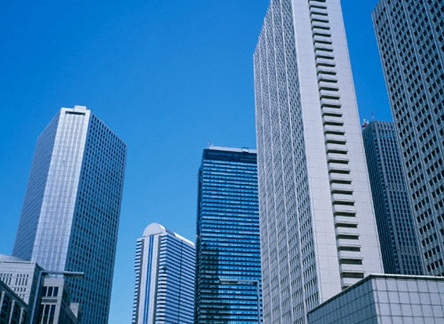 With the ambitious development of global business, KDDI has established medium-term targets for growth both in and outside Japan, and is focused on achieving those targets. To bring a sense of urgency to transforming itself and continuing to grow not only in the telecommunications business, its specialty, but in new business fields as well, KDDI is aiming to secure and develop human resources capable of reacting quickly to change and working to build a stronger workforce in order to achieve sustainable growth. 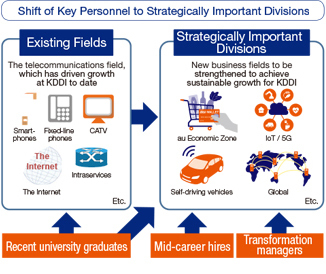 Under the medium-term targets concluding in the fiscal year ending March 31, 2019, KDDI is aiming for continuous profit growth based on the three business strategies of "sustainable growth in the domestic telecommunications business," "maximize the 'au Economic Zone,'" and "ambitiously develop global business." 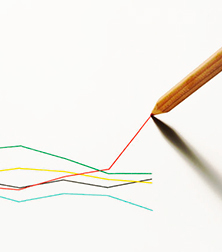 To achieve these medium-term targets, KDDI is focused primarily on the following four approaches. In April 2017, KDDI set up the Human Resource Development Division, putting strategic hiring, utilization and development of human resources under its jurisdiction to maximize the value of our human resources and ensure their appropriate allocation. As it prepares to expand into new business areas, KDDI is promoting a shift of personnel into new fields and those that need strengthening. This is being done both by offering in-house job opportunities and hiring top-level industry personnel to head our transformation efforts. In addition, we are also proactively promoting the hiring of mid-career personnel with expertise in new business fields, putting in place a base for pushing forward with and bringing a sense of urgency to the restructuring of our business. 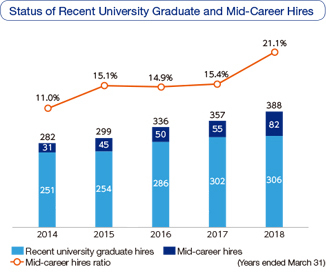 As a result of steady progress with these efforts, KDDI expanded mid-career hires to 82 people in the fiscal year ended March 31, 2018, while also expanding the ratio of mid-career hires to all hires to 21.1%. KDDI will continue working to hire and develop the personnel needed for sustainable growth, including human resources to lead new businesses and transform data-driven operations, as well as highly specialized personnel capable of responding to change in the era of IoT and 5G. 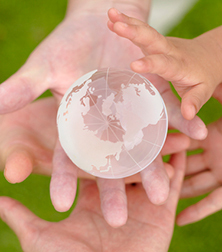 To achieve its goal of ambitiously developing global business, KDDI continues to implement measures designed to support the cultivation of global human resources. For management positions, these include the Global Intensive Program (GIP) global executive training designed for the acquisition of practical English language ability utilizing business skills with the goal of developing executive candidates and future global leaders. 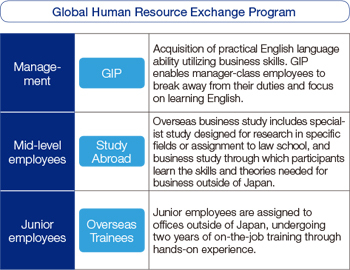 KDDI has also established educational programs tailored to each employee's career stage, including overseas business study programs for mid-level employees and overseas trainee programs for junior personnel. By working to create a culture in which employees with diverse personalities and backgrounds of different genders, ages and nationalities can respect and understand one another, KDDI has put in place an environment in which each individual can maximize his or her potential. The KDDI Group Philosophy expresses the attitudes, values and behavior that employees should practice in 5 chapters with 38 items. 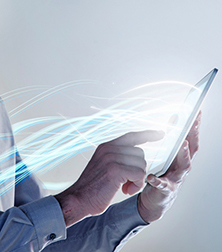 It incorporates the KDDI identity and KDDI vision that we must embrace as a telecommunications operator. 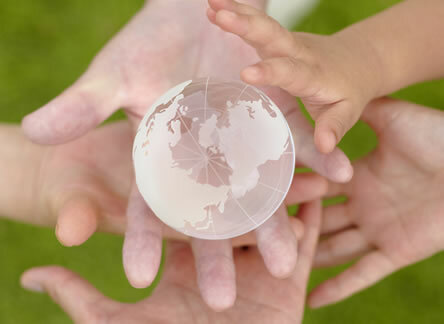 The KDDI Group Philosophy also describes the basic attitudes KDDI employees need to maintain and is the foundation for sustainability at KDDI. 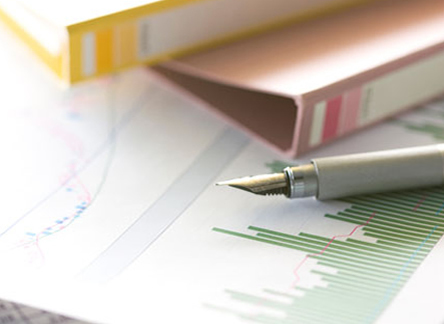 By putting the KDDI Group Philosophy into practice, we aim for sustainable growth by striving to be a company admired and trusted by all stakeholders. As we have ambitiously developed global business in recent years, it is becoming essential that all of our employees take action with a shared set of values to generate synergies and strengthen ties between each business division. Since the revision of the KDDI Group Philosophy in 2013, KDDI has conducted awareness-raising activities for employees inside and outside Japan to help spread the philosophy. 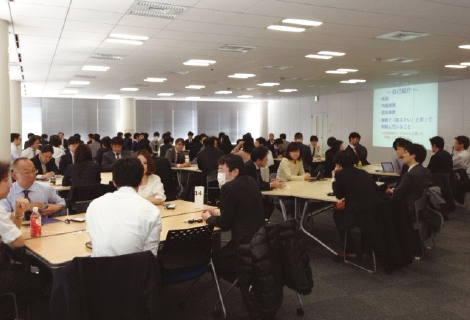 In the fiscal year ended March 31, 2018, a total of 572 study meetings were held as part of efforts to promote the dissemination of the KDDI Group Philosophy both in Japan and abroad. Going forward, we will share the KDDI Group Philosophy with all of our employees, and promote sustainable management by pursuing our mission as a whole.